High Level Supersonic Interceptor in defence of the Fleet. Low Level/Medium Level Interceptor in defence of the Fleet. Combat Air Patrol (CAP). 1 hour 45 minute loiter capability on station without air to air refuelling. Ground Attack. "2 High Explosive Rocket Projectiles. Ground Attack. Bombing. 500 lb/1000lb bombs. 10/20/60 degree dive angle delivery, also high speed 400ft low level retard bombing. Lepus Illumination of Night Targets for attack. Day/Night/All Weather Operational Capabillity from an Aircraft Carrier. Individual Mission Descriptions under construction. The Phantom F4K below is an RAF aircraft. It is here to show the missile fit. Four Sparrow Missiles were semi embedded in the belly and four Sidewinder AIM9 Missiles were carried on the Pylons. The RN did not have the Gattling Gun on the Center Station. The RN preferred configuration was a Center Line Fuel Tank. Pylons were used for Ordinance. 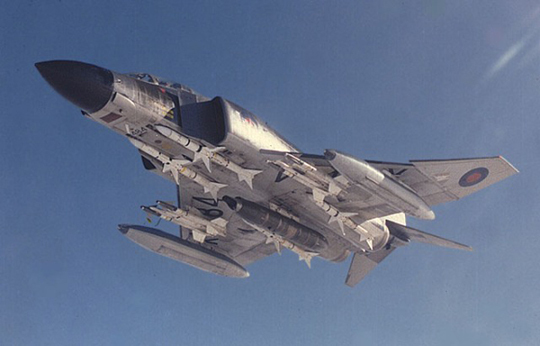 When the Fleet Air Arm was disbanded in 1978, the Royal Naval Phantom F4K's were handed over to the RAF.